← Do I Have Your Attention Yet? On Wednesday, July 24th, recently appointed Eastern Regional Forester, Kathleen Atkinson toured the Randolph Community Forest. The visit came as part of a tour of the White Mountain National Forest (WMNF). During the tour, representatives from Randolph’s Forest Commission and the WMNF learned the history of the 10,000-acre community forest, and the working relationship between the town and Forest Service. The group traveled along the Pond of Safety road, stopping at a new wildlife opening, as well as the beautiful, remote Pond of Safety itself. 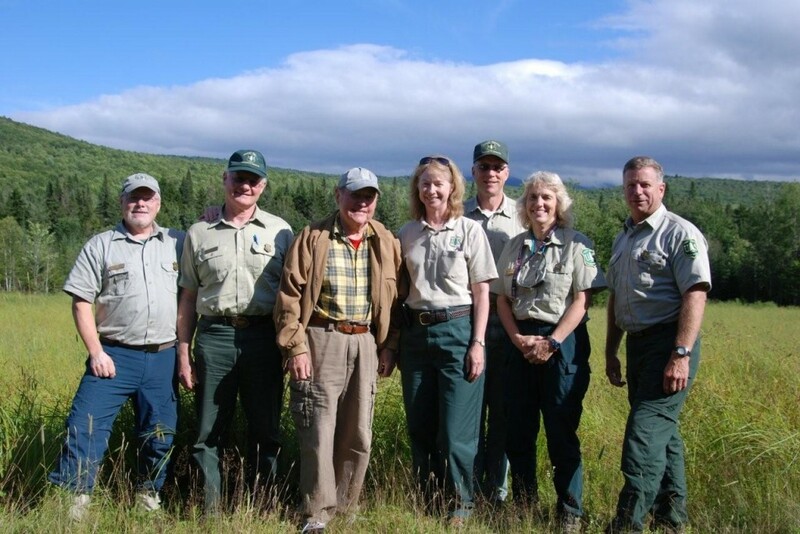 Left to Right: Roger Simmons, WMNF Ecosystem Team Leader, Dee Hines, WMNF Deputy Forest Supervisor, David Willcox, Randolph Community Forest, Kathleen Atkinson, Eastern Region Regional Forester, Bill Dauer, WMNF Technical Services Team Leader & Forest Engineer, Katie Stuart, Androscoggin District Ranger, Tom Wagner, WMNF Forest Supervisor. Photo courtesy of John Scarinza, Chair, Randolph Community Forest Commission. Atkinson comes to the Regional Office from the Forest Service’s national headquarters in Washington, D.C. where she has served as associate deputy chief for business operations. Prior to this, she was the Agency’s director of strategic planning, budget and accountability. Her 30-year Forest Service career has encompassed a variety of positions and locations. Ms. Atkinson oversees a total of seventeen national forests and grasslands in Illinois, Indiana, Maine, Michigan, Minnesota, Missouri, New Hampshire, Ohio, Pennsylvania, Vermont, West Virginia and Wisconsin.